According to Stampfl and Nießner, it is very likely that the neurotransmitter noradrenaline is responsible for the increased heart rate brought on by nanoparticles. Noradrenaline is released by nerve endings in the inner wall of the heart. It increases the heart rate and also plays an important role in the central nervous system – a tip-off that nanoparticles might also have a damaging effect there. Stampfl and his team used their heart model to test carbon black and titanium dioxide nanoparticles, as well as spark-generated carbon, which serves as a model for airborne pollutants stemming from diesel combustion. In addition, silicon dioxide, different Aerosil silicas used e.g. as thickening agents in cosmetics, and polystyrene were tested. Carbon black, spark-generated carbon, titanium dioxide and silicon dioxide led to an increase in the heart rate of up to 15 percent with altered ECG values that did not normalize, even after the nanoparticle exposure was ended. The Aerosil silicas and polystyrene did not show any effect on the heart function. 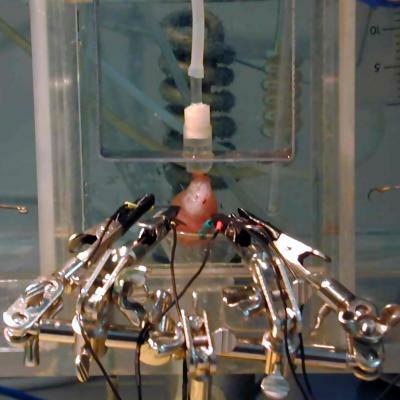 This new heart model may prove to be particularly useful in medical research. Here, artificial nanoparticles are increasingly being deployed as transportation vehicles. Their intrinsically large surfaces provide ideal docking grounds for active agents. The nanoparticles then transport the active agents to their destination in the human body, e.g. a tumor. Most of the initial prototypes of such “nano containers” are carbon or silicate based. So far, the effect of these substances on the human body is largely unknown. The new heart model could thus serve as a test organ to help select those particles types that do not affect the heart in a negative way. Artificial nanoparticles are also used in many industrial products – some of them since decades. Their small size and their large surfaces (compared to their volume) impart these particles with unique characteristics. The large surface area of titanium dioxide (TiO2), for example, leads to a large refractive index that makes the substance appear brilliant white. It is thus often used in white coating paints or as a UV blocker in sunscreens. So-called carbon black is also a widely used nanoparticle (mainly in car tires and plastics) with over 8 million tons produced annually. The small size of these nanoparticles (they measure only 14 nanometers across) makes them well suited as dyes, e.g. in printers and copying machines.